Your search for the perfect set of cups is finally over Worried about toxins, phthalates, lead and other chemicals contained in your family's tableware? Looking for an alternative to plastic cups? Had enough of your kids breaking glasses? 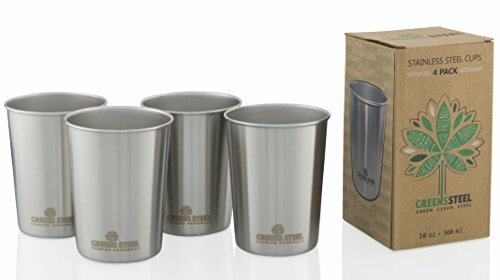 Want a cup you can use both in the home and outdoors designed for a lifetime of daily use?One green stainless steel cup to the rescue The last set of cups you'll ever need to buy Ideally sized and a must have for any parents with kids. Finely crafted with the highest quality 18/8 food grade stainless steel BPA -free, phthalate-free, lead and toxin-free - no nasties - pure steel Polished on the inside to ensure your cups remain rust-free and impart no unwanted flavors. Perfect for any occasion and great as a gift Unrivaled quality/ precision engineered. Order now and take advantage of our limited introductory pricing; only while stocks last Why not consider getting one as a memorable gift for the VIP’s in your life. GREAT FOR KIDS - Are you looking for that perfect set of cups for your kids?? We were too, but couldn't find anything! That's why we created the Greens Steel 10oz Stainless Steel Cups. We've cut no corners, using only the Highest Quality Premium 304 18/8 Food Grade Stainless Steel. Our Kids love them and we know yours will too! ⭐SUPERIOR FINISHING INSIDE & OUT - Our cups our polished with a brushed finish, giving them a smooth exterior, AND electro-polished on the inside so your cups remain pure and rust-free! Imparting NO nasty metallic taste or unwanted flavors. Clean tasting drinks every time. With so many second-rate cups available on the market we wanted to set ourselves apart and be the best! ♻HEALTHY, SAFE & ENVIRO-FRIENDLY - No nasties guaranteed. BPA Free, Phthalate-free, Lead and Toxin-Free. Our cups are always environmentally friendly and completely recyclable (including packaging). Keep it clean! Keep it Green! ✅EASY TO STORE AND CLEAN - Our tumblers are stackable and easy to wash by-hand or in the dishwasher. Also there are no sharp edges making our cups super easy to drink from. ✔LIFETIME GUARANTEE & 100% SATISFACTION - Yes! All Greens Steel Products come with a LIFETIME GUARANTEE! 100% Satisfaction or your money back. Order now and put us to the test! Don't settle for any less. If you have any questions about this product by Greens Steel, contact us by completing and submitting the form below. If you are looking for a specif part number, please include it with your message.